To evaluate the impact of the lens aberrations on the adaptive optics visual simulation of pseudophakic intraocular lens (IOL) profiles. In 20 right phakic eyes, lens higher order aberrations (HOAs) were calculated as the whole eye minus the corneal aberrations. Visual simulation using low and high contrast corrected distance visual acuity (CDVA) testing was carried out with the VAO instrument (Voptica, SL, Murcia, Spain), considering three optical conditions of the lens: removing HOA (no lens-HOA), removing spherical aberration (no lens-SA), and with lens HOA (natural condition). In addition, a through-focus visual simulation of a trifocal diffractive IOL profile with high contrast CDVA was also measured in two conditions: no lens-HOA and natural condition. Three different pupil sizes (3, 4.5, and 6 mm) were tested for all conditions. There were no significant intersubject differences between the three optical conditions and in the IOL simulation for all pupil sizes (P > .05). 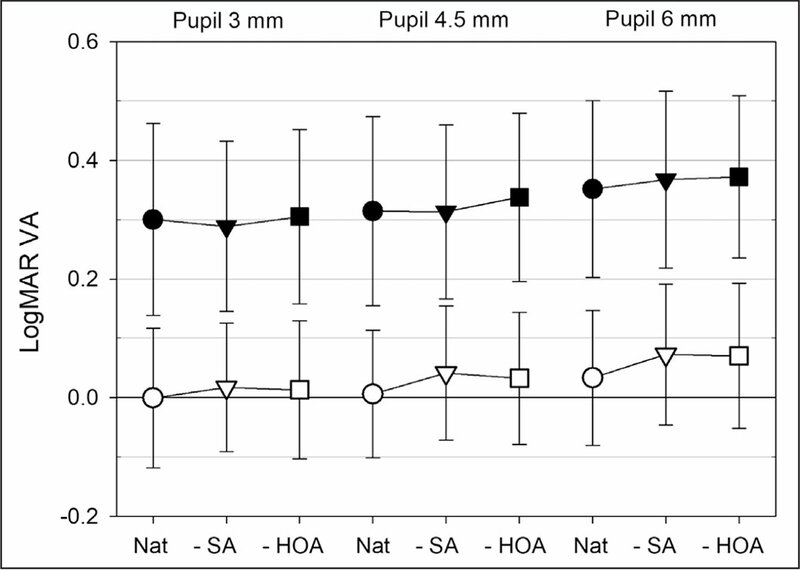 For 4.5- and 6-mm pupils, mean VA values of the no-lens SA and no lens-HOA conditions were similar and slightly worse than those of the natural condition. Individual differences between the no lens-HOA condition and the other two optical conditions, estimated as 95% limits of agreement, were acceptable for 3-mm pupil but worse as pupil diameter increased. The effect of lens aberrations on visual simulation is imperceptible for a small pupil diameter of 3 mm. Although the increment of pupil size increases the probability of patients with significant visual impact of lens HOAs, the mean intersubject VA differences are negligible. The appropriate IOL design for each eye is chosen based on commercial information and/or clinical experience. However, the optimization in the selection of the best IOL design could improve the postoperative visual performance. The spherical aberration of the commercially available lenses ranges between positive and negative values increasing or compensating partially or totally for the positive values of the cornea. The best option of each patient could depend on how different factors affect the visual performance of each one. Although the total compensation of corneal spherical aberration provides better optical quality,8 the neural adaptation to preoperative low positive values of spherical aberration, currently present in children and adults, could also influence visual performance.9–11 On the other hand, the depth of focus induced by different values of spherical aberration could be customized depending on each patient.12–14 So, in this context, the selection of the optimum monofocal IOL based on preoperative visual simulation of different values of spherical aberration corresponding to available monofocal IOLs could improve the visual outcomes of pseudophakic patients. Patients implanted with multifocal IOLs achieve good values of high contrast visual acuity (VA) at far and near distances, but complaints of glare, halos, and blurred vision are frequently reported.15–18 For the same multifocal design, the type and grade of adverse visual effects depends on each patient. Therefore, preoperative visual simulation of different available multifocal designs would allow for each patient to select the best option, which could reduce postoperative visual complaints and improve the satisfaction of patients. Adaptive optics visual simulators show any visual test through any optical profile.19 These instruments measure objective refraction and ocular aberrations and are capable of correcting or inducing any optical profile while performing visual testing. In cataract surgery or refractive lens exchange, different IOL designs can be simulated to predict the visual outcomes before the actual surgery is performed.20,21 During the simulation, the retinal image (ie, the visual perception of the eye) is affected by the cornea, crystalline lens, and induced profile of the simulated IOL, but after surgery the lens will not be present. Lens aberrations can be removed in the simulated profile, but corneal topography measurements are needed to calculate their values as the whole eye minus the corneal aberrations. To evaluate the need to use a corneal topographer in visual simulation of IOL profiles, we measured the impact of lens aberrations on visual simulation of monofocal and multifocal diffractive profiles measuring high and low contrast visual acuity in phakic eyes for different pupil sizes. Optical measurements and visual simulations were undertaken using the VAO instrument (Voptica, SL, Murcia, Spain) with the extra option of different pupil sizes. Figure A (available in the online version of this article) shows an optical scheme of the system that consists of three main optical arms. One of them has a Hartmann-Shack sensor to measure the wavefront aberrations of the eye, one uses a SVGA micro OLED to display visual stimuli, and the third has a liquid crystal on silicon spatial light modulator that induces the desired optical phase profile. To simulate the visual performance of any optical pattern, visual testing is performed while the eye is looking through the optical profile induced by the spatial light modulator. Objective refraction from the Hartmann-Shack sensor measurements can be refined using the spatial light modulator to obtain the subjective refraction. The spatial light modulator is able to reproduce any kind of optical phase profile, even diffractive, at any viewing distance. Optical scheme of VAO instrument (Voptica, SL, Murcia, Spain). 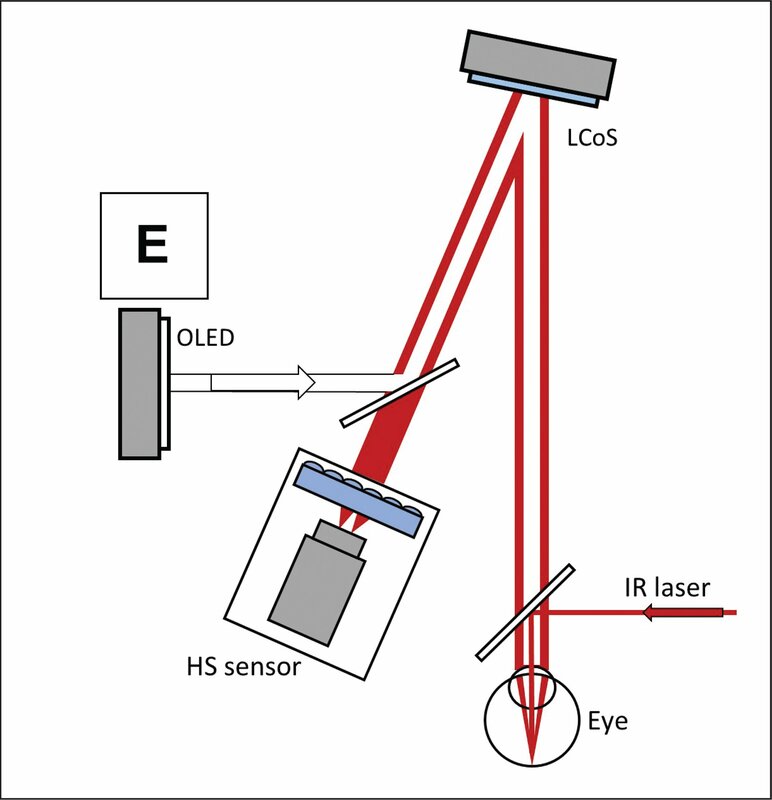 A Hartmann-Shack (HS) system is used to measure the ocular aberrations with a 780-nm laser beam (IR LED). A spatial light modulator (LCoS) induces any optical phase profile while the eye is seeing a visual test displayed by a screen (OLED). The experiment was performed monocularly in the right eyes of 20 phakic patients aged 25 to 43 years. All were myopic eyes with a spherical equivalent between −1.00 and −4.00 diopters (D) and astigmatism below 1.00 D. The study followed the tenets of the Declaration of Helsinki and informed consent was obtained from all patients. The pupil was dilated and accommodation paralyzed by instilling tropicamide. First, for each eye, from the topography measurements with a Placido-based corneal topographer (Atlas software version 1.0.1.0; Carl Zeiss Meditec AG, Jena, Germany), the associated wavefront aberrations of the first surface of the cornea realigned to the pupil center were estimated by a ray-tracing procedure.22,23 The aberrations of the whole eye were measured with the VAO instrument. The lens aberrations were estimated by direct subtraction of ocular and corneal values expressed as Zernike coefficients up to the fifth order. The posterior surface of the cornea was not considered because previous studies reported higher order aberration (HOA) values that were too low24 (around zero in most patients25,26) with respect to the anterior surface to be relevant. Natural. No profile is simulated. All optical aberrations of the whole eye were considered including lens HOAs. No lens-SA. Profile to neutralize spherical aberration of the lens. Because the spherical aberration is the most important aberration considered in the design of pseudophakic IOLs, the effect of removing the spherical aberration was tested. No lens-HOA. Profile to neutralize HOAs of the lens. The optimum condition to simulate any optical profile of a pseudophakic IOL is removing HOAs of the lens. Therefore, we considered this condition as the baseline to compare with the other conditions. Furthermore, for the conditions of the natural and no lens-HOA conditions, the through-focus high contrast CDVA was also measured for a customized diffractive trifocal profile with intensity distribution of 45%, 20% and 35% at far (0.00 D), intermediate (1.40 D), and near (2.80 D) viewing distances, respectively. All visual acuity measurements were carried out for three different pupil diameters: 3, 4.5, and 6 mm. From the three measurements of visual acuity, we calculated the means and the standard deviations for each patient and condition. To evaluate the statistical significance in the differences between intersubject VA values for different conditions in relation to the baseline condition, the P values from the paired sample t test were calculated. We also estimated the intersubject mean of VA differences and the 95% limits of agreement (LoA)29 with respect to the baseline condition. 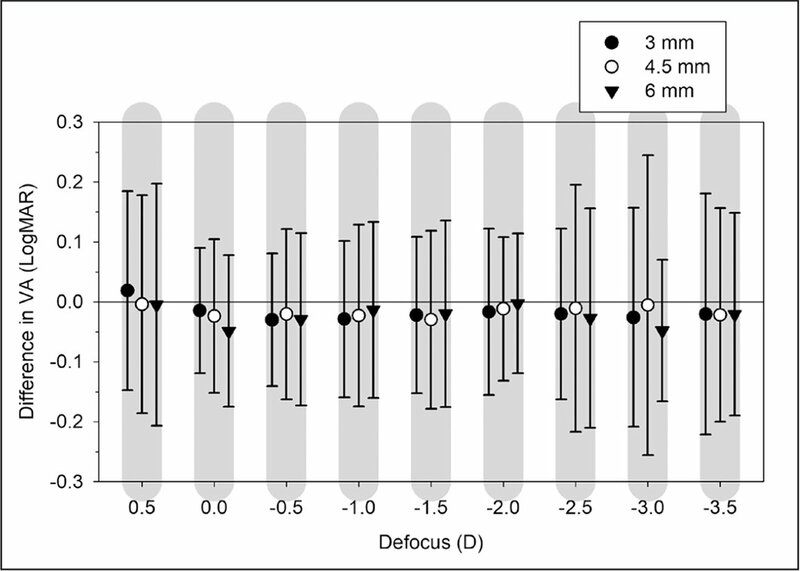 Figure 1 shows the mean values of both ocular optical parameters, RMS of HOAs, and visual Strehl ratio computed in frequency domain for a 6-mm pupil diameter. Contrary to RMS values, higher values of visual Strehl ratio computed in frequency domain mean better image quality. The RMS increased and the visual Strehl ratio computed in frequency domain decreased slightly as spherical aberration of the lens was removed due to the disruptions of spherical aberration compensation between the cornea and lens.22,30 However, mean values of both optical parameters were similar in the natural and no lens-HOA conditions. Mean values of root mean square (RMS) of higher order aberrations (HOA) and visual Strehl ratio optical transfer function (VSOTF) for a 6-mm pupil diameter in different conditions: natural (Nat), no lens-spherical aberration (-SA), and no lens-HOA (-HOA). Mean values of high and low contrast VA (in logMAR units) measured in the three optical conditions are displayed in Figure 2. As expected, in all conditions and pupil sizes VA was better for high contrast letters, but the performance for both contrast values were similar. For larger pupil diameters (4.5 and 6 mm), VA worsened as spherical aberration and HOAs of the lens were removed, probably due to the disruption of aberration compensation of the cornea and lens. But intersubject VA values of the baseline condition (no lens-HOA) and the other two conditions were not significantly different (P > .05). 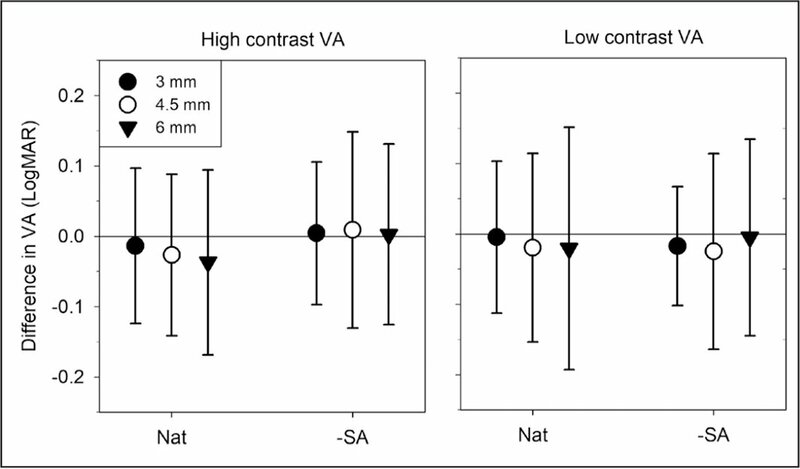 Mean values of high (white symbols) and low (black symbols) contrast visual acuity (VA) of patients for 3-, 4.5-, and 6-mm pupil diameters for natural (Nat), no lens-spherical aberration (-SA), and no lens-HOA (-HOA) conditions. 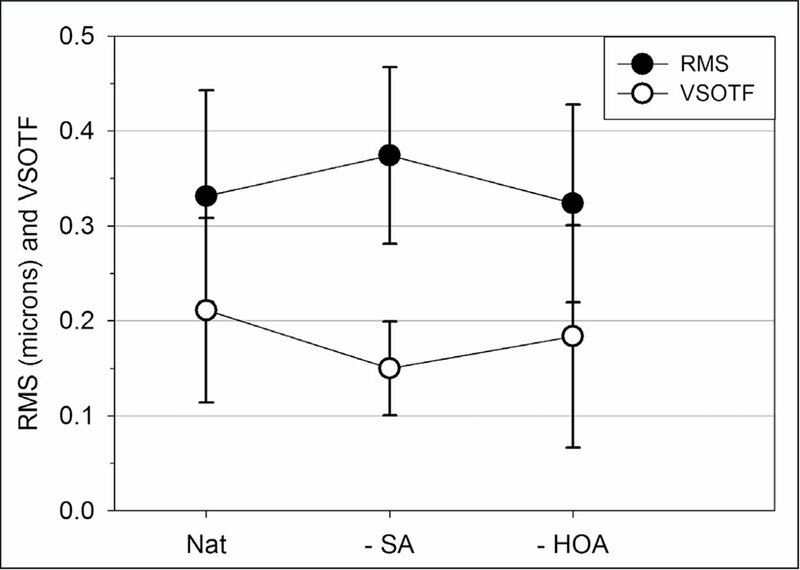 As shown in Figure 3, the mean intersubject values of differences in VA were small but slightly negative in some conditions because some of the patients had slightly worse VA values with no lens-HOA than with the other two conditions. 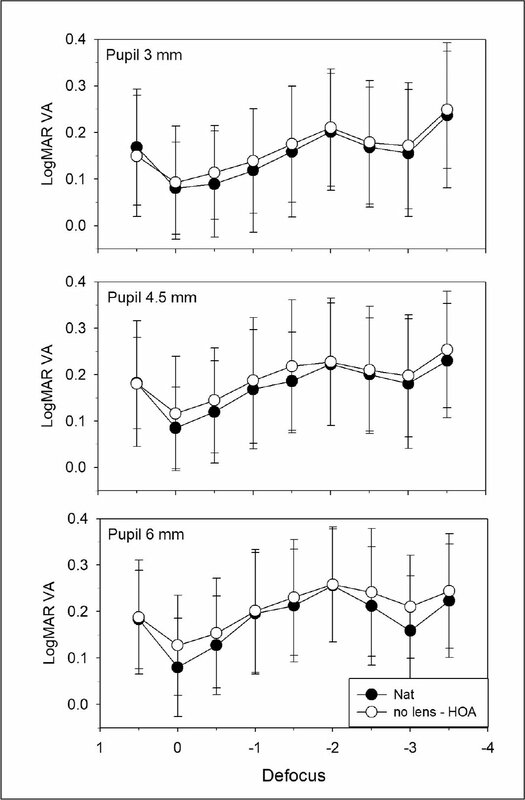 These differences in high and low contrast VA between the natural and no lens-HOA conditions increased progressively with pupil diameter, from values around zero for a 3-mm pupil to values around −0.04 logMAR for a 6-mm pupil. As expected, lower differences (between +0.01 and −0.02 logMAR) were found between the no lens-SA and no lens-HOA conditions because the spherical aberration is normally predominant in HOAs. VA intervals that enclosed 95% of individual differences, expressed as LoA values, were lower in the 3-mm pupil size, for both conditions and letters contrasts. For natural conditions and both contrasts, an increment of LoA was found as pupil size increased: maximum values of 0.11, 0.14, and 0.17 logMAR for 3-, 4.5-, and 6-mm pupil diameters, respectively. For the no lens-SA condition, LoA were also lower for the 3-mm pupil and similar for 4.5- and 6-mm pupils: maximum values of 0.10, 0.14, and 0.14 logMAR for 3-, 4.5-, and 6-mm pupil diameters, respectively. Values of LoA up to approximately 0.10 logMAR were considered clinically acceptable because that value is the logMAR step between VA lines in the configuration of the Early Treatment Diabetic Retinopathy Study (ETDRS) test. So, the 3-mm pupil gave more tolerable LoA than the larger pupil sizes. Mean intersubject visual acuity (VA) differences of baseline condition with respect to natural (Nat) and no lens-spherical aberration (-SA) conditions, calculated as the subtraction of the baseline from the other conditions. Positive values mean better VA in the baseline condition. Errors bars are the 95 % limits of agreement. Figure 4 shows the defocus curve with intersubject mean values of VA looking through the simulated trifocal diffractive profile, for both optical conditions (natural and no lens-HOA). For the three pupil sizes and all values of defocus except +0.50 D and 3- and 4.5-mm pupils, VA was slightly worse because HOAs of the lens were removed, but these differences were not significant (P > .05). Through-focus curves trifocal diffractive profile with mean values of high contrast visual acuity (VA) in natural (Nat) and no lens-higher order aberrations (HOA) conditions. As shown in Figure 5, mean intersubject VA differences through the trifocal profile were slightly negative in all defocus values, except in defocus +0.50 D and 3-mm pupil, especially for 0.00 and −3.00 D (far and near foci of the simulated trifocal lens) and 6-mm pupil with differences of −0.05 logMAR. The values of LoA ranged between 0.10 and 0.25 logMAR for all pupil sizes. Although the LoA were lower for the 3-mm pupil diameter in practically all defocus values, these values were higher in comparison with measurements without trifocal lens simulation (Figure 3), probably due to the effect of optical quality deterioration caused by diffraction on individual differences between the natural and no lens-HOA conditions. Mean intersubject visual acuity (VA) differences of baseline (no lens-HOA) and natural (Nat) conditions, calculated as natural condition minus baseline, as a function of defocus values through the trifocal diffractive profile. Positive values mean better VA in the baseline condition. Errors bars are the 95% limits of agreement. The effect of the crystalline lens on visual simulation of IOL profiles before cataract surgery is essential to know if it is necessary to consider corneal topography in the simulation. The lens is still present during the simulation, but after surgery it will be removed. If the lens aberrations affect the results of visual simulation, they should be removed during the simulation, including the correction of them in the simulated profile. But we cannot measure these aberrations directly. We need to measure the ocular and corneal aberrations before the simulation to calculate those of the lens by subtracting the corneal aberrations from the whole eye. This would require an extra instrument (corneal topographer) and is more time-consuming. In addition to clinical application, the visual simulation is also used by ophthalmic companies to test new optical profiles. In the field of IOL manufacturing, visual simulation of new designs permits evaluation of the visual performance before fabricating them and allows them to fabricate only designs that fulfill initial visual requirements. In this way, the companies with a visual simulator save economic resources in manufacturing and in clinical studies to test new designs. To study the effect of lens aberrations on visual simulation, we measured optical quality (RMS of HOA and visual Strehl ratio computed in frequency domain) and VA in the natural condition and removing spherical aberration and all HOA of the lens. Most patients had similar VA in the three conditions for the 3-mm pupil size, whereas the mean VA in the other two conditions was similarly worse as the pupil size increased. Although intersubject differences in the VA were not significant (P > .05) for the three pupil sizes, individual differences, estimated as 95% LoA, were more acceptable as the pupil size decreased. The effect of lens aberrations on visual performance could be mainly explained by the disruption of neural adaptation of the visual system to the natural optical aberrations, which is more evident in larger pupil sizes.9–11 Because spherical aberration of the lens was removed, there was a decompensation of this aberration between the cornea and lens, providing a deterioration in the optical quality. Although removing HOAs of the lens did not significantly affect the optical parameters, the ocular optical pattern changed in all patients. Furthermore, we also measured the effect of lens aberrations in the simulation of a diffractive trifocal profile as an example of multifocal IOL design. In the through-focus visual simulation of this profile, the mean VA was slightly worse without lens aberrations. This difference is larger at far and near foci of the simulated trifocal lens for the largest pupil size of 6 mm, but there were no significant differences (P > .05) between intersubject VA with and without lens aberrations. In the elderly, photopic and scotopic pupil diameters hardly ever exceed 3- and 4.5-mm, respectively. In patients with limited scotopic vision, the visual simulation of IOL profiles could be done for the 3-mm pupil diameter without considering corneal topography. However, in patients with larger pupil sizes, corneal HOAs or at least spherical aberration should be considered in visual simulations. Despite the variations found with pupil diameter, the intersubject differences are not significant. So, in the field of design and manufacturing of IOLs, if the simulation studies to test visually different designs are done in groups of patients, the mean visual behavior of each optical profile is independent of lens aberrations for all pupil sizes. Artal P, Chen L, Fernández EJ, Singer B, Manzanera S, Williams DR. Adaptive optics for vision: the eye's adaptation to point spread function. J Refract Surg. 2003;19:S585–S587. Marcos S, Barbero S, Jiménez-Alfaro I. Optical quality and depth-of-field of eyes implanted with spherical and aspheric intraocular lenses. J Refract Surg. 2005;21:223–235. Fernández EJ, Manzanera S, Piers P, Artal P. Adaptive optics visual simulator. J Refract Surg. 2002;18:S634–S638. From Laboratorio de Óptica, Departamento de Física, Universidad de Murcia, Murcia, Spain (EAV, SM, CML, LH, LS, PA); and Voptica, SL, Murcia, Spain (LH). Supported by European Research Council Advanced Grant No. ERC-2013-AdG-339228 (SEECAT), SEIDI, Spain (Grant No. FIS2013-41237-R), and Fundacion Séneca-Agencia de Ciencia y Tecnología de la Región de Murcia (19897/GERM/15). Drs. Villegas, Manzanera, and Artal have a personal financial interest in and Dr. Hervella is an employee of Voptica, SL. The remaining authors have no financial or proprietary interest in the materials presented herein. © 2019 Villegas, Manzanera, Lago, et al.